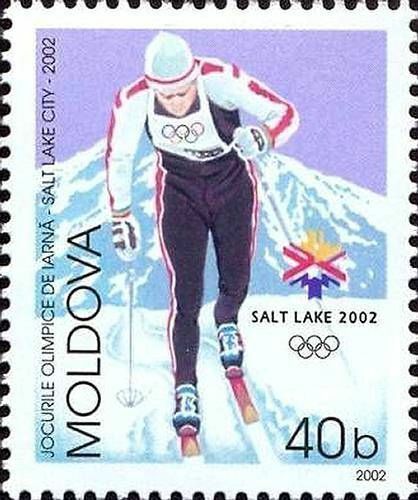 On 8 February 2002, the Post Office of Moldova (Poșta Moldovei) issued a series of postage stamps with the title Winter Olympic Games, Salt Lake City 2002. The issue comprises two stamps, with associated cancellation (postmark) and first day cover (FDC). The designer was Oleg Cojocaru. The printing was performed by Bundesdruckerei, Germany. The 2002 Winter Olympics, officially the XIX Olympic Winter Games, was a winter multi-sport event that was celebrated in February 2002 in and around Salt Lake City, Utah, United States. Approximately 2,400 athletes from 77 nations participated in 78 events in fifteen disciplines, held throughout 165 sporting sessions. The 2002 Winter Olympics and the 2002 Paralympic Games were both organized by the Salt Lake Organizing Committee (SLOC). Utah became the fifth state in the United States to host the Olympic Games, and the 2002 Winter Olympics are the most recent games to be held in the United States. Read more.. This article uses material from the Wikipedia article '2002_Winter_Olympics', which is released under the Creative Commons Attribution-Share-Alike License 3.0. The cross-country skiing events at the 2002 Winter Olympics were marred by drug problems. 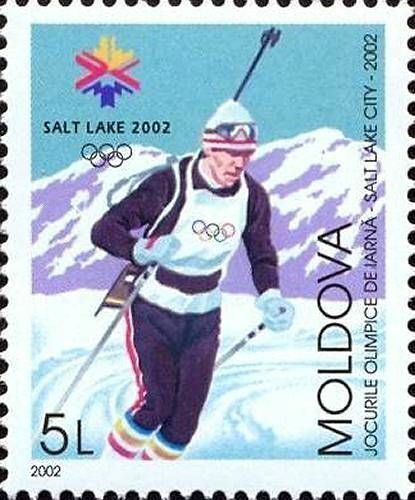 The winners of three races were disqualified after blood tests showed that three skiers had overly high red blood cell counts indicating the use of darbepoetin, a drug used to treat anemia. At the time, the drug was not specifically listed in the IOC's list of banned substances, but the Olympic rules generally prohibit doping of any kind, in accordance with its charter. After two years and several lawsuits in Olympic and Swiss courts, the skiers in question (Johann Mühlegg of Spain, and Larissa Lazutina and Olga Danilova of Russia) were stripped of all their medals from the 2002 Games. Read more.. This article uses material from the Wikipedia article 'Cross-country_skiing_at_the_2002_Winter_Olympics', which is released under the Creative Commons Attribution-Share-Alike License 3.0. Biathlon at the 2002 Winter Olympics consisted of eight biathlon events. They were held at Soldier Hollow. The events began on 11 February and ended on 20 February 2002. For the first time since 1992, the biathlon program expanded. A new race type, the pursuit was added, the first new race type since the debut of the sprint in 1980 Read more.. This article uses material from the Wikipedia article 'Biathlon_at_the_2002_Winter_Olympics', which is released under the Creative Commons Attribution-Share-Alike License 3.0.